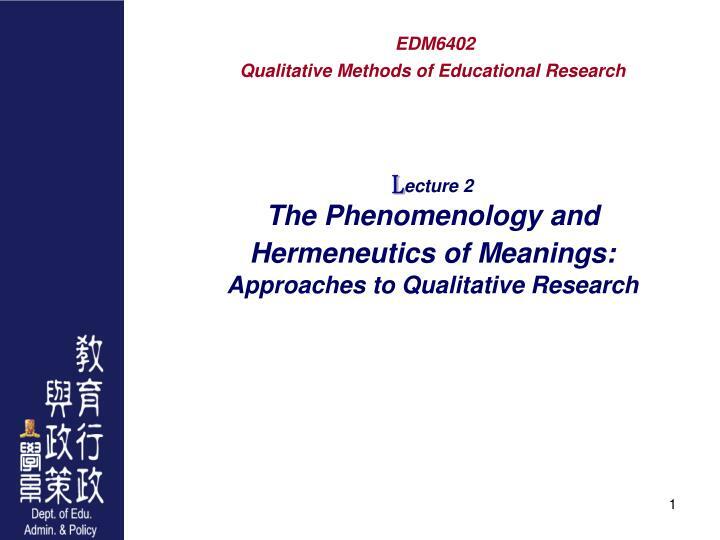 EDM6402 Qualitative Methods of Educational Research L ecture 2 The Phenomenology and Hermeneutics of Meanings: Approaches to Qualitative Research. 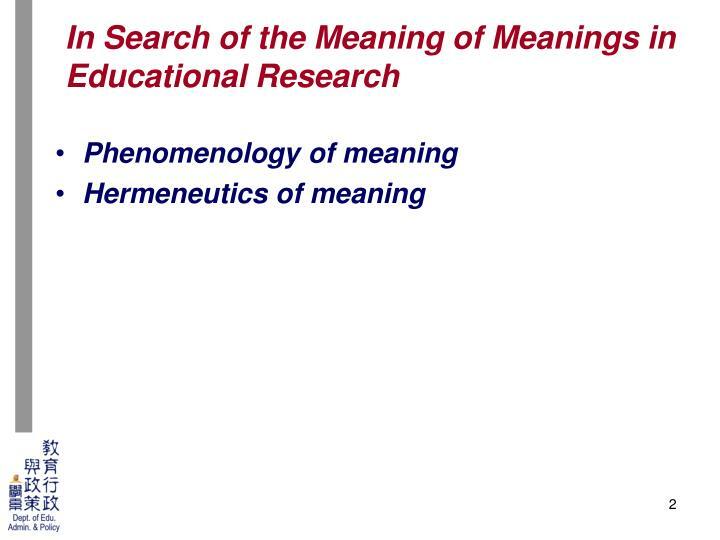 In Search of the Meaning of Meanings in Educational Research. 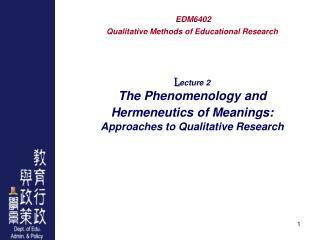 Phenomenology of meaning Hermeneutics of meaning. 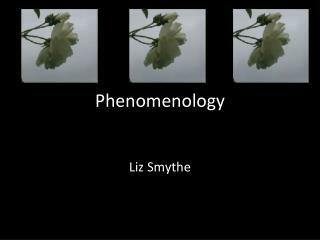 In contrast to mode of inquiry in natural science, which emphasizes observations of and experimentation with things in the external world, phenomenology turns inwards to investigate human reflection, consciousness, and subjectivity; and poses the question of how a particular experience stands out (i.e. 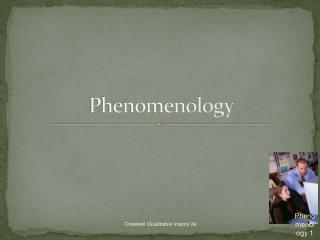 appears) to become so significant that we would grant them attention, intention and consciousness. 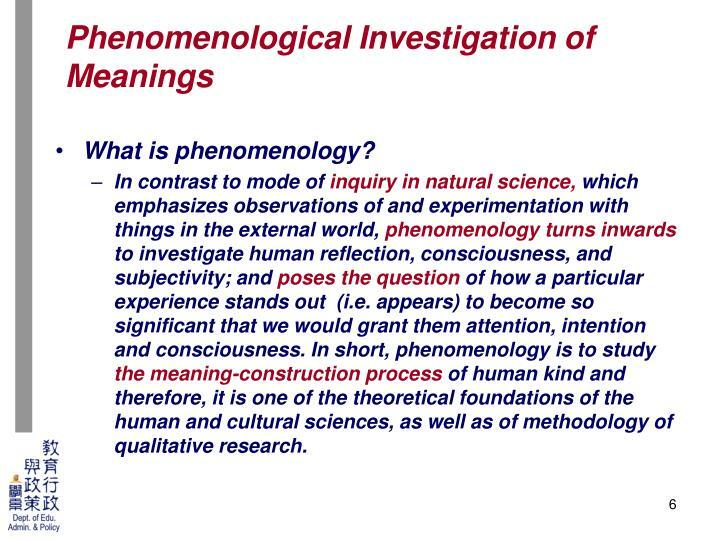 In short, phenomenology is to study the meaning-construction process of human kind and therefore, it is one of the theoretical foundations of the human and cultural sciences, as well as of methodology of qualitative research. 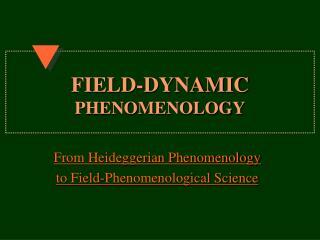 Hernri Bergson, another the founding figures of phenomenology, stipulates that we humans are not only living within the world of discrete and concrete space and time, but also in the stream of consciousness. 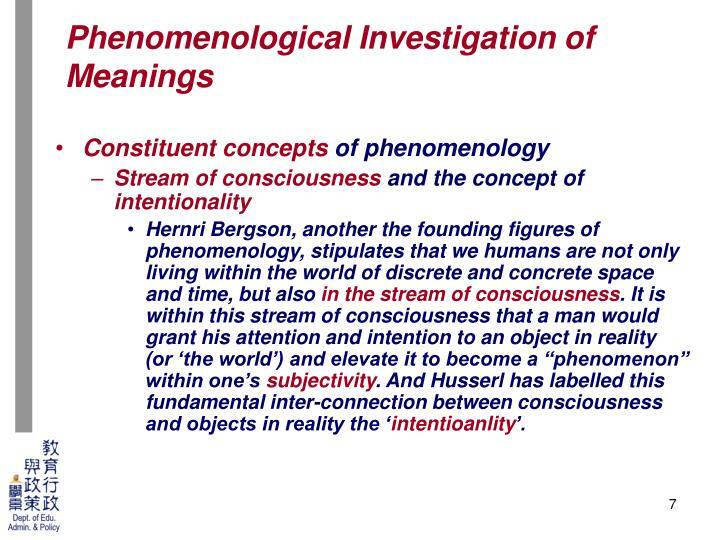 It is within this stream of consciousness that a man would grant his attention and intention to an object in reality (or ‘the world’) and elevate it to become a “phenomenon” within one’s subjectivity. 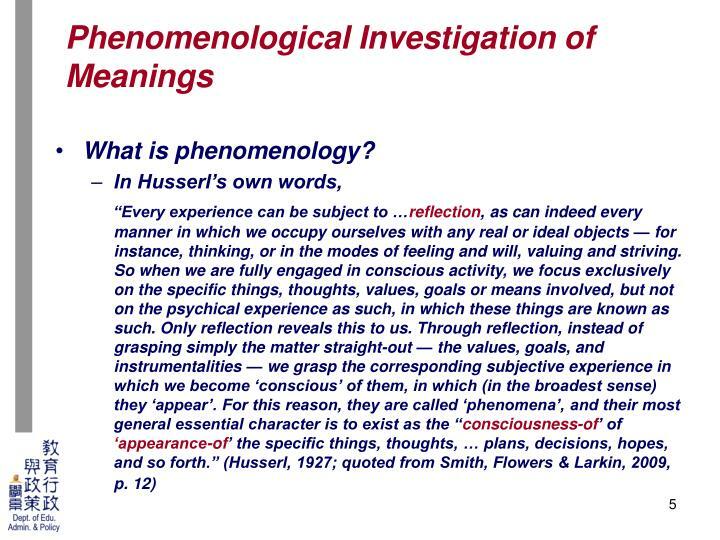 And Husserl has labelled this fundamental inter-connection between consciousness and objects in reality the ‘intentioanlity’. 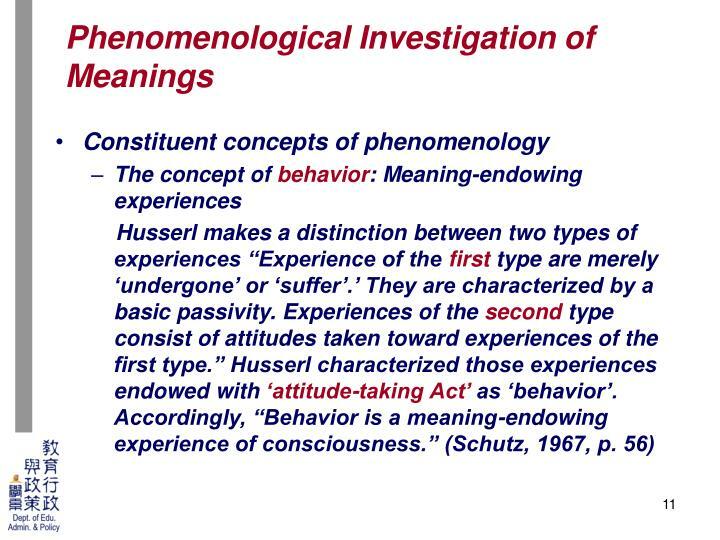 The process of intentionality has been differentiated by Husserl into two components, namely noema and noesis. 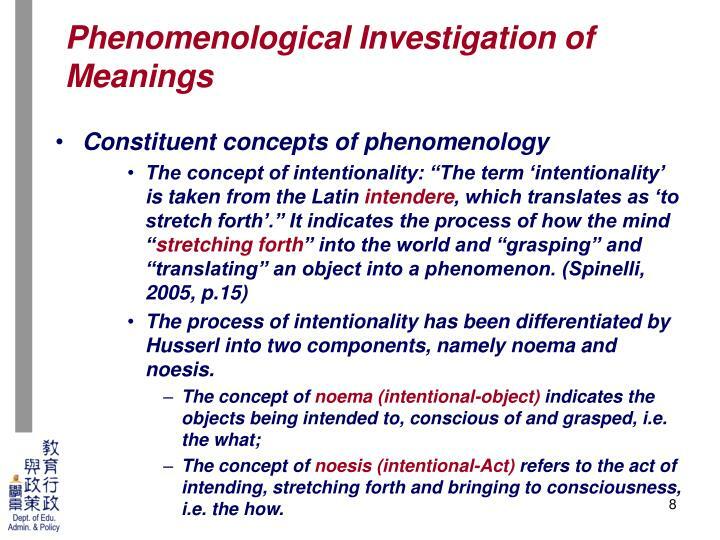 The concept of noesis (intentional-Act) refers to the act of intending, stretching forth and bringing to consciousness, i.e. the how. 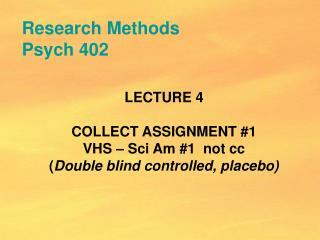 Perception: It refers to the “now-apprehension” granted to an experience by human minds during the immediate encounter. 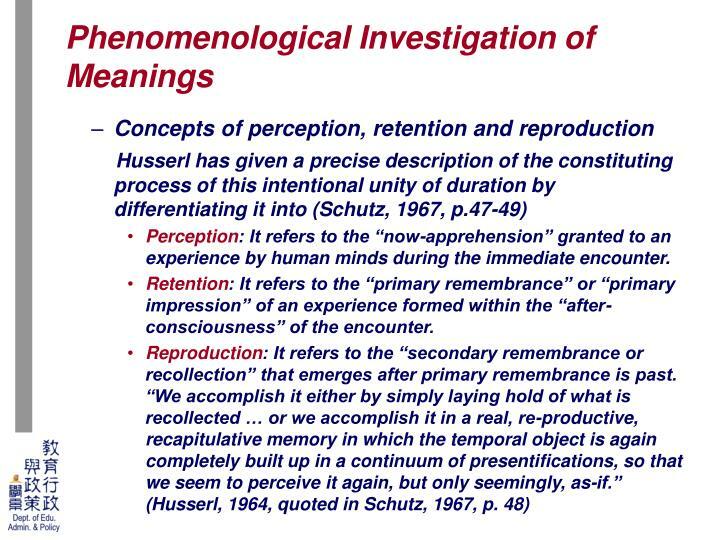 Retention: It refers to the “primary remembrance” or “primary impression” of an experience formed within the “after-consciousness” of the encounter. 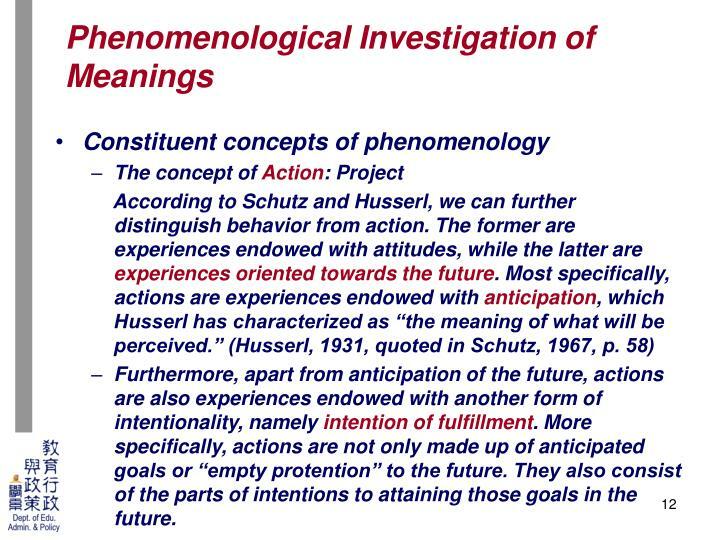 Furthermore, apart from anticipation of the future, actions are also experiences endowed with another form of intentionality, namely intention of fulfillment. 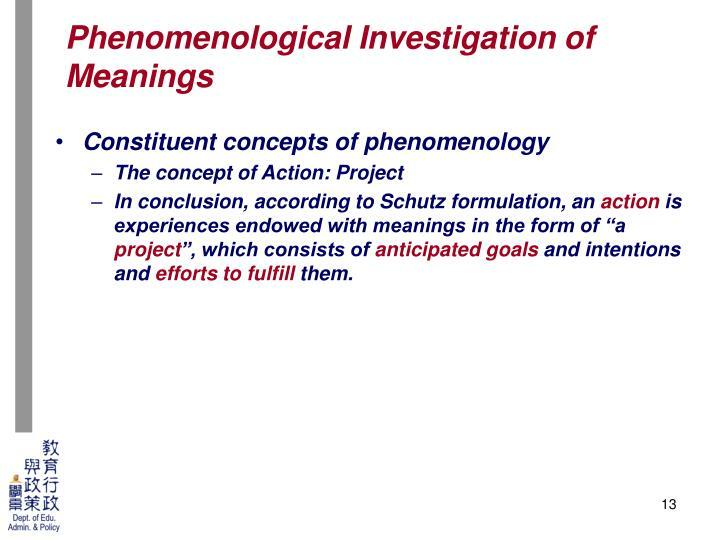 More specifically, actions are not only made up of anticipated goals or “empty protention” to the future. 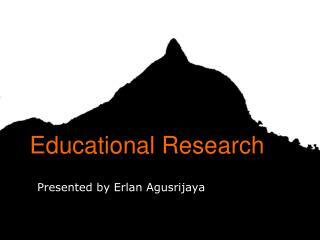 They also consist of the parts of intentions to attaining those goals in the future. 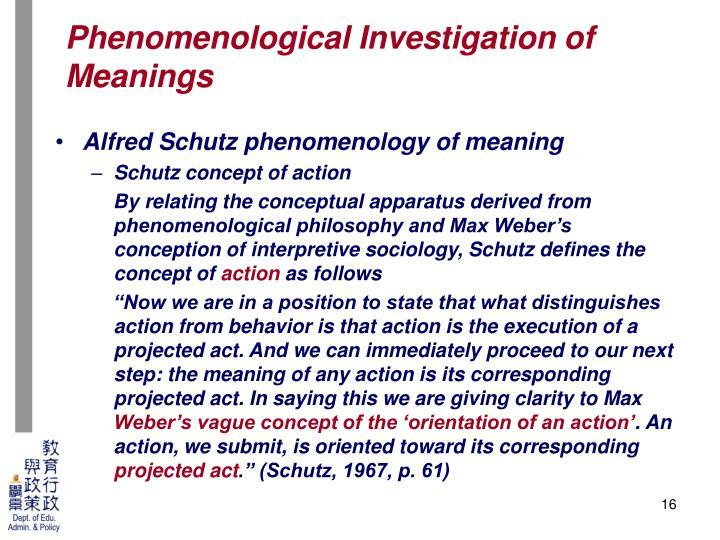 In conclusion, according to Schutz formulation, an action is experiences endowed with meanings in the form of “a project”, which consists of anticipated goals and intentions and efforts to fulfill them. Unity: Though intentional acts and/or fulfillment-act various meaning-endowing experiences are unified and integrated into coherent whole within the Ego. 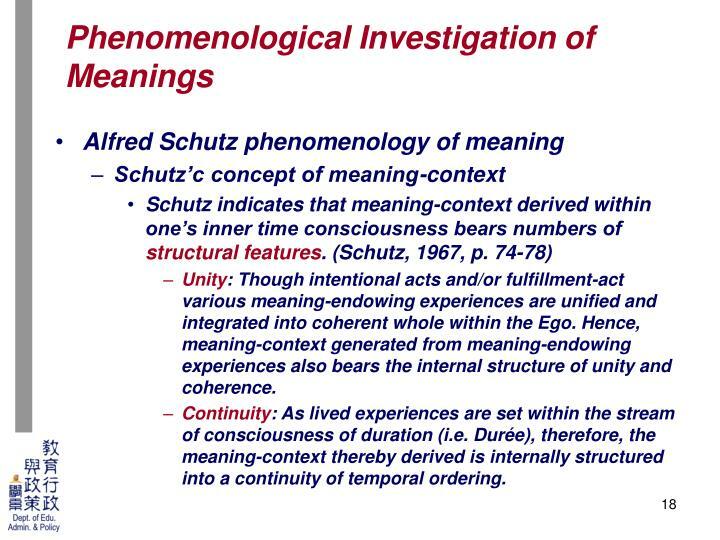 Hence, meaning-context generated from meaning-endowing experiences also bears the internal structure of unity and coherence. 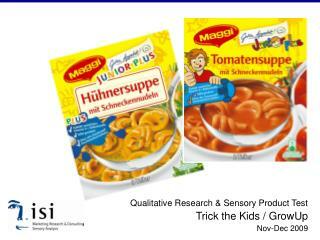 Continuity: As lived experiences are set within the stream of consciousness of duration (i.e. 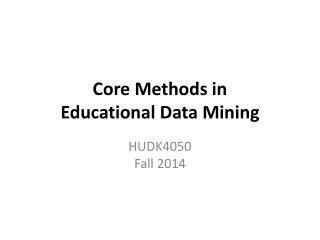 Durée), therefore, the meaning-context thereby derived is internally structured into a continuity of temporal ordering. 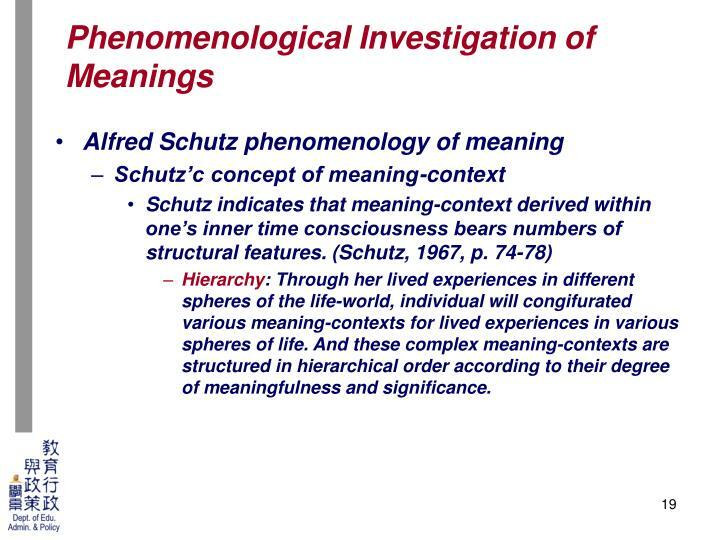 Hierarchy: Through her lived experiences in different spheres of the life-world, individual will congifurated various meaning-contexts for lived experiences in various spheres of life. 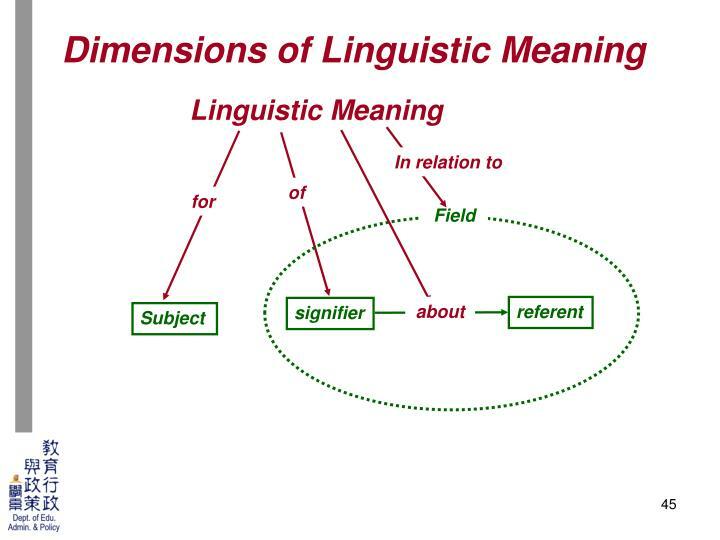 And these complex meaning-contexts are structured in hierarchical order according to their degree of meaningfulness and significance. 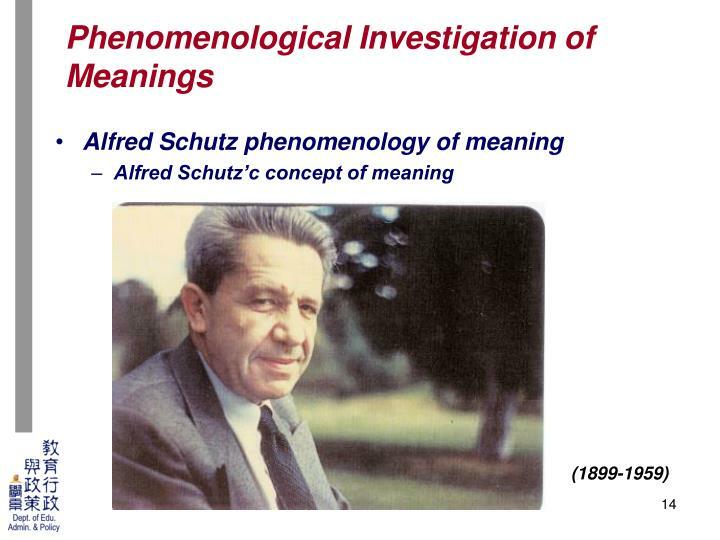 As a practicing sociologist, Alfred Schutz’s major contribution to phenomenological studies is to extend the study of human consciousness and experiences from individual level to social level. 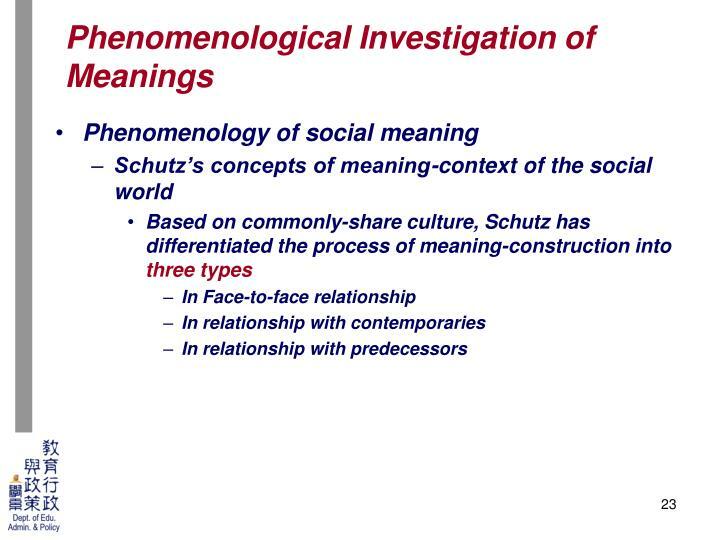 Built on phenomenological investigations of meaning-configurations and meaning-contexts of individuals, Schutz poses the questions: How meaning-configurations among individuals are possible? 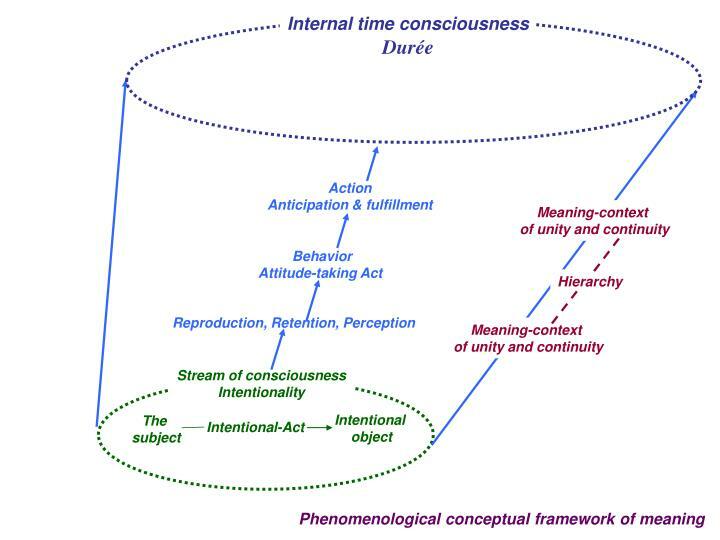 More specifically, how meanings among different inner consciousnesses of durations are able to be corresponded, shared or even come to consensus? 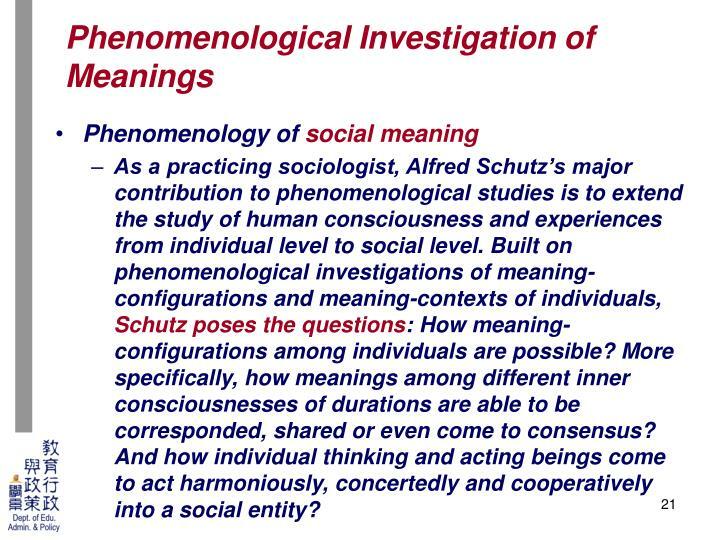 And how individual thinking and acting beings come to act harmoniously, concertedly and cooperatively into a social entity? 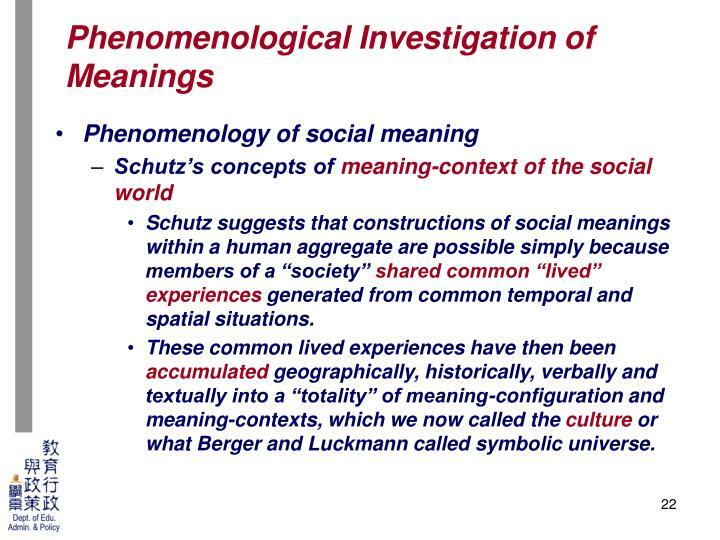 Schutz suggests that constructions of social meanings within a human aggregate are possible simply because members of a “society” shared common “lived” experiences generated from common temporal and spatial situations. 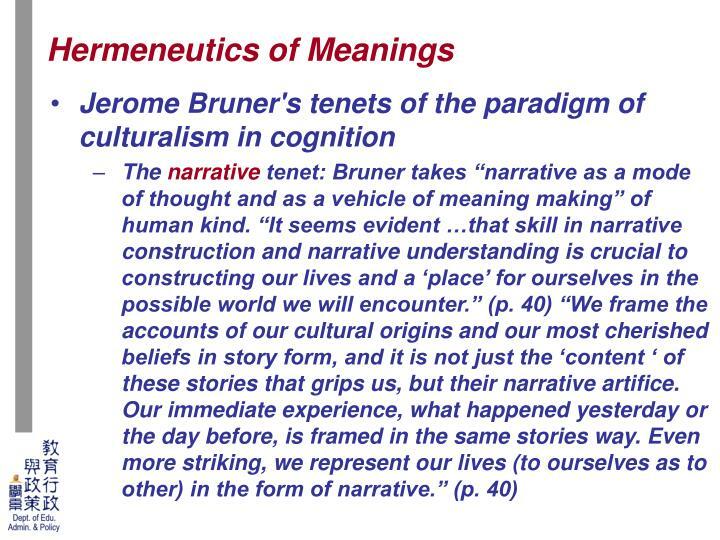 These common lived experiences have then been accumulated geographically, historically, verbally and textually into a “totality” of meaning-configuration and meaning-contexts, which we now called the culture or what Berger and Luckmann called symbolic universe. 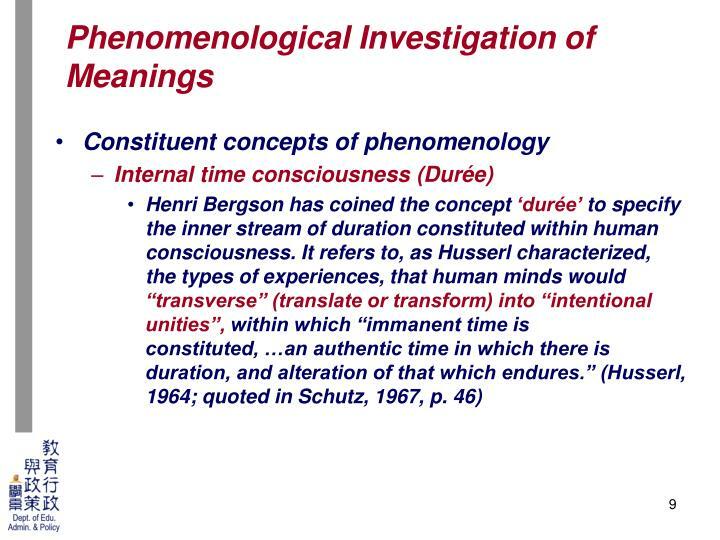 The primary base of mutual understanding between two humans in face-to-face situation is that there are two inner consciousnesses of durations who share similar if not the same temporal-spatial flows, that is, each is conscious of the other’s presence. 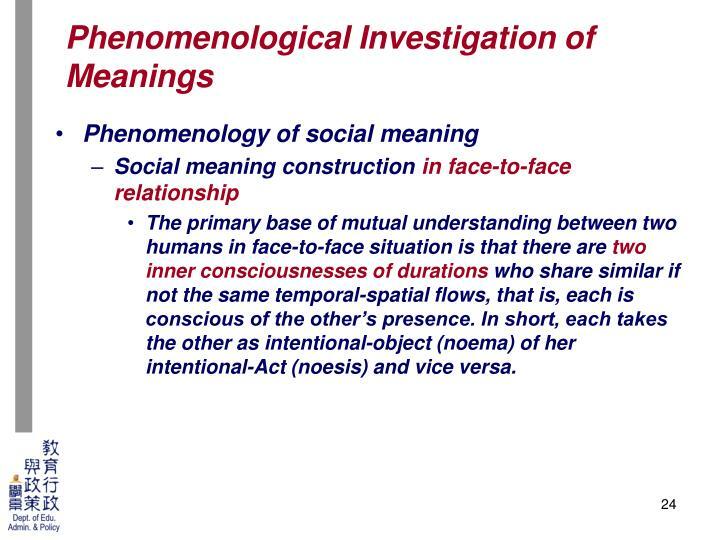 In short, each takes the other as intentional-object (noema) of her intentional-Act (noesis) and vice versa. 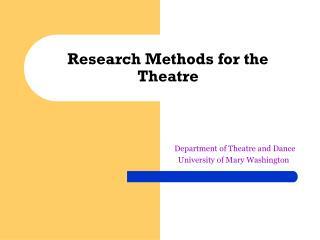 In constructing a sign, the actor undertakes the act of signification, that is, to assign a sign to an object in the external world. 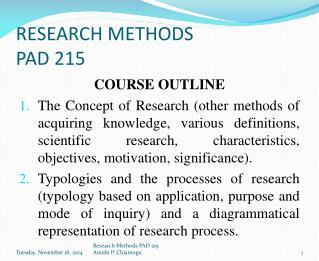 As on the part of the reader of the sign, she has to undertake an act of interpretation, which has been defined as the core activities that qualitative researchers have to undertake. 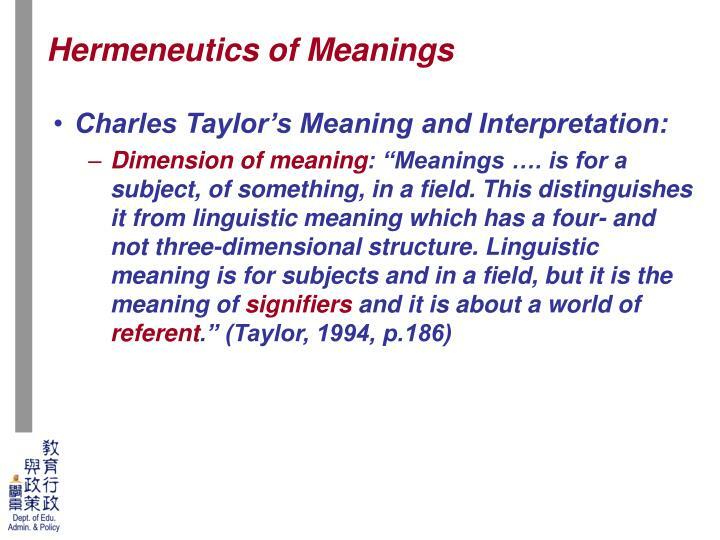 Spoken and written signs in a language are the exemplary representations of sign used by human kind. 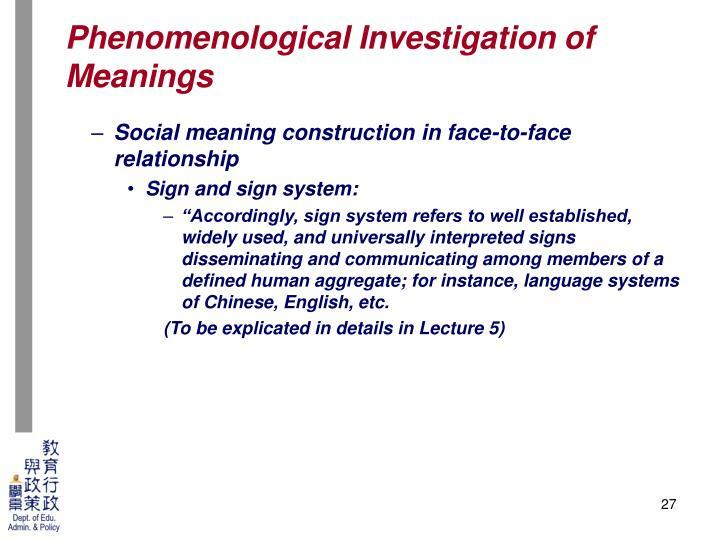 “Accordingly, sign system refers to well established, widely used, and universally interpreted signs disseminating and communicating among members of a defined human aggregate; for instance, language systems of Chinese, English, etc. 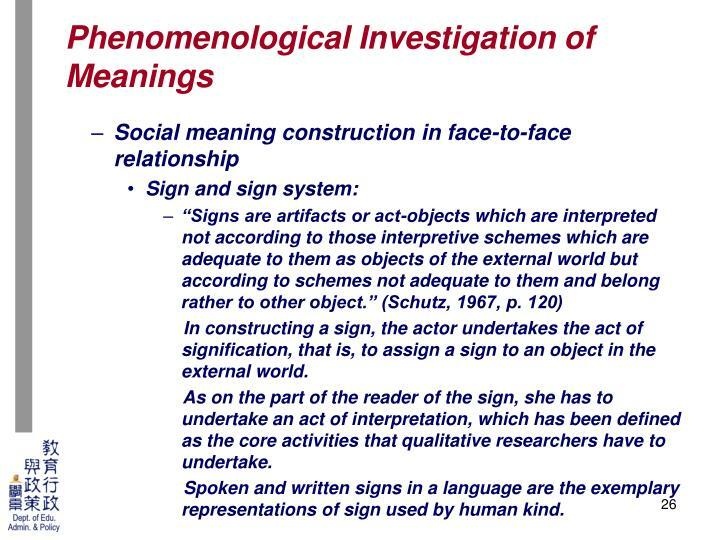 The concept of externalization of subjectivity: It is within a sign system, i.e. 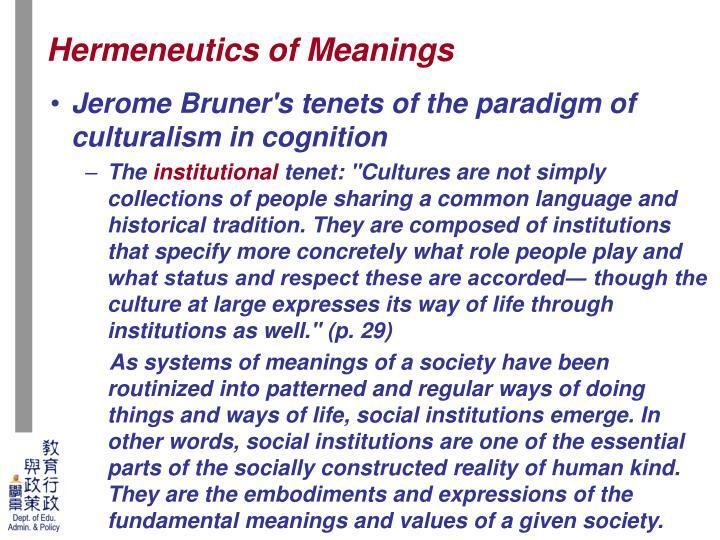 a culture and/or a cultural system, that subjective experiences and consciousnesses of individuals can be externalized and communicate to other members of the corresponding language and/or cultural system. 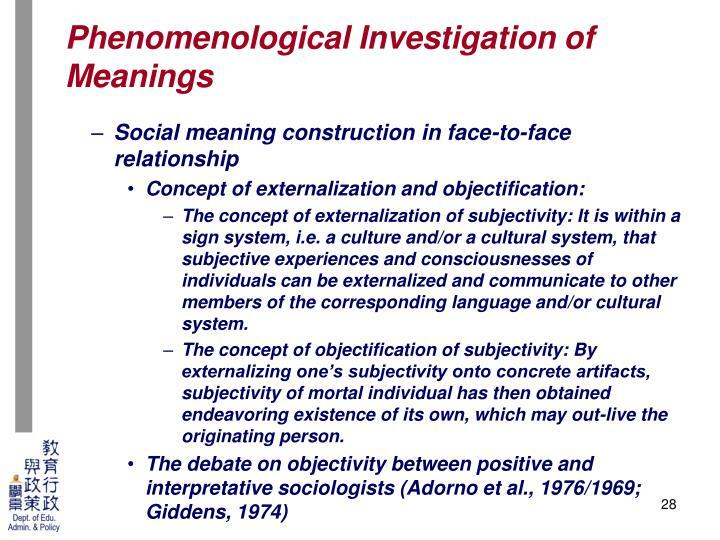 The concept of objectification of subjectivity: By externalizing one’s subjectivity onto concrete artifacts, subjectivity of mortal individual has then obtained endeavoring existence of its own, which may out-live the originating person. 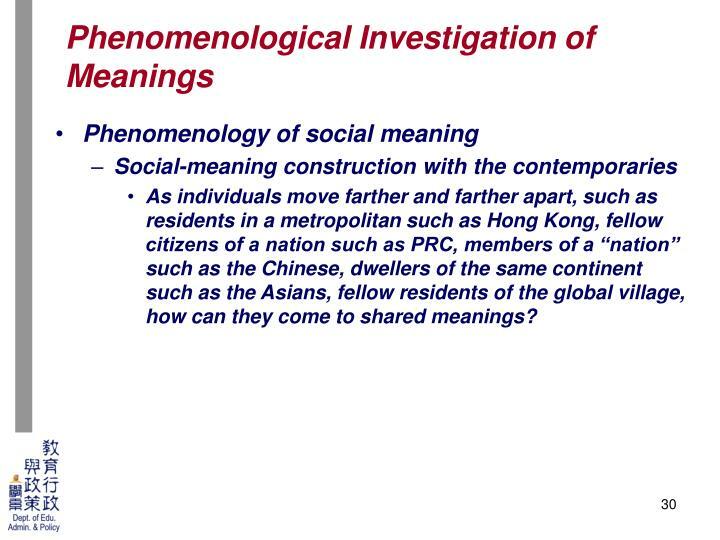 As individuals move farther and farther apart, such as residents in a metropolitan such as Hong Kong, fellow citizens of a nation such as PRC, members of a “nation” such as the Chinese, dwellers of the same continent such as the Asians, fellow residents of the global village, how can they come to shared meanings? 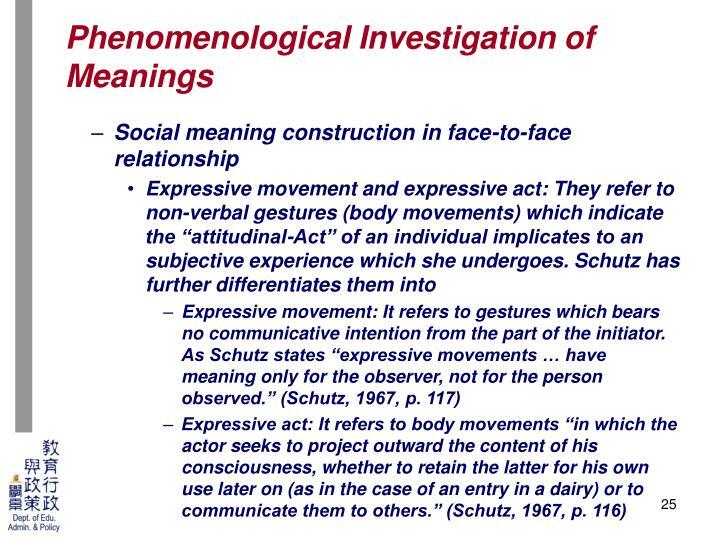 As contemporaries, who are located in physically long distance which does not enable them to have face-to-face confirmation of their meanings to their counterparts, they have to then presume and rely on the ideal-typical interpretive schema generated and established in so-called “institutional contexts”. 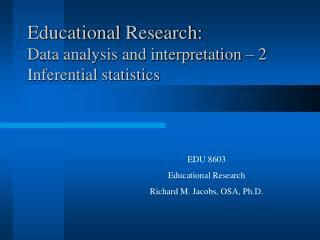 For examples, the ideal-typical role-performances prescribed to teachers and students in modern educational institutions; ideal-typical role-performances presumed by both the husband and the wife in the marriage institution; or sellers and buyers in international trade or cyber-transactions. 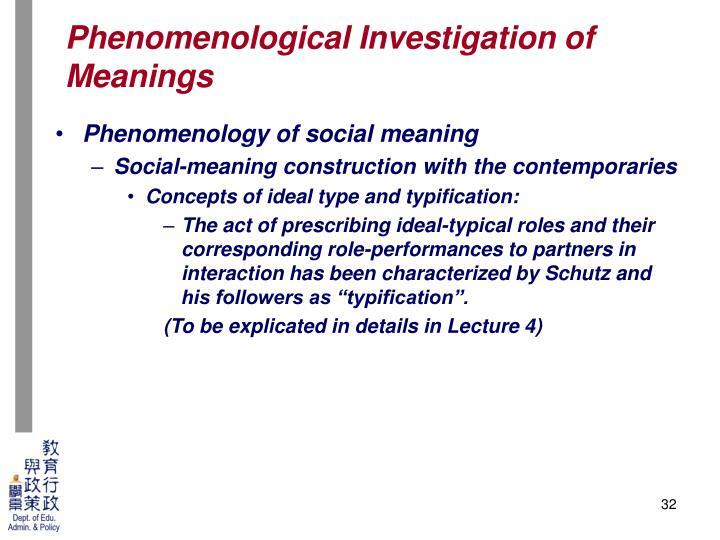 The act of prescribing ideal-typical roles and their corresponding role-performances to partners in interaction has been characterized by Schutz and his followers as “typification”. 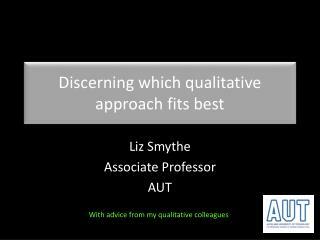 Accordingly, the concepts of institution and institutionalization have been reformulated and used by followers of Alfred Schuts, such as Berger and Luckmann, and advocates of New-institutionalism in qualitative researches in social sciences in recent decades. 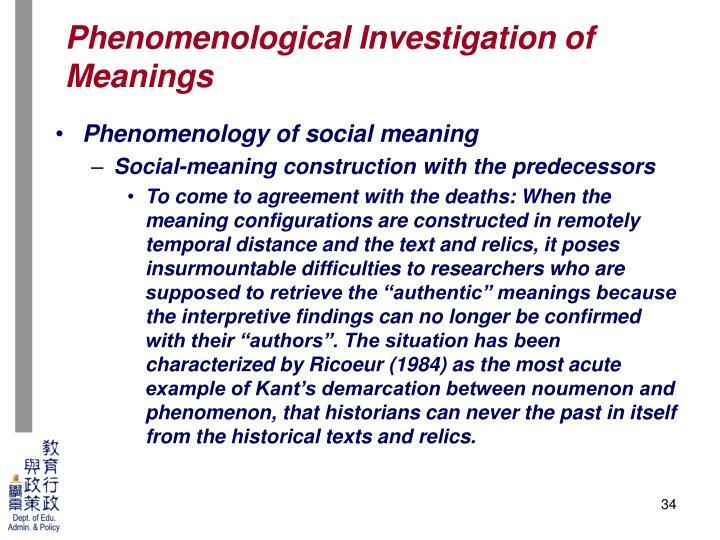 To come to agreement with the deaths: When the meaning configurations are constructed in remotely temporal distance and the text and relics, it poses insurmountable difficulties to researchers who are supposed to retrieve the “authentic” meanings because the interpretive findings can no longer be confirmed with their “authors”. 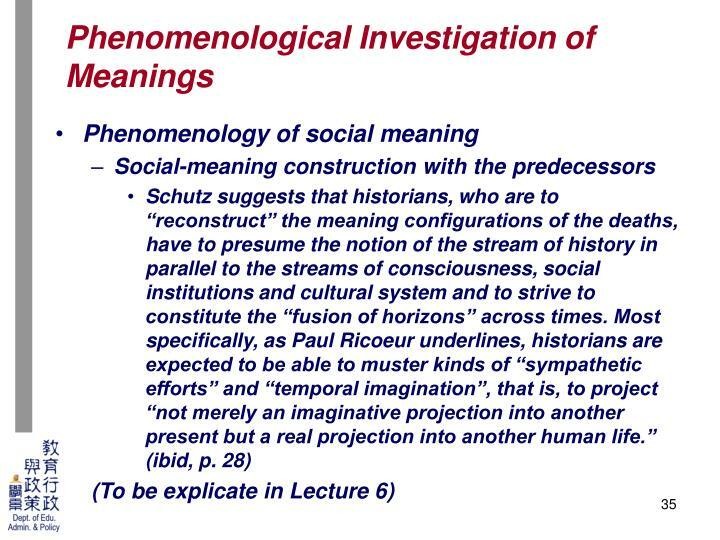 The situation has been characterized by Ricoeur (1984) as the most acute example of Kant’s demarcation between noumenon and phenomenon, that historians can never the past in itself from the historical texts and relics. 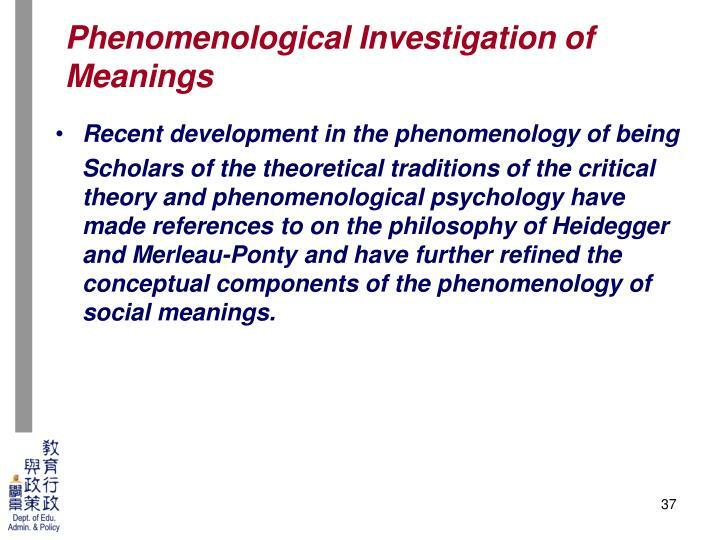 Scholars of the theoretical traditions of the critical theory and phenomenological psychology have made references to on the philosophy of Heidegger and Merleau-Ponty and have further refined the conceptual components of the phenomenology of social meanings. 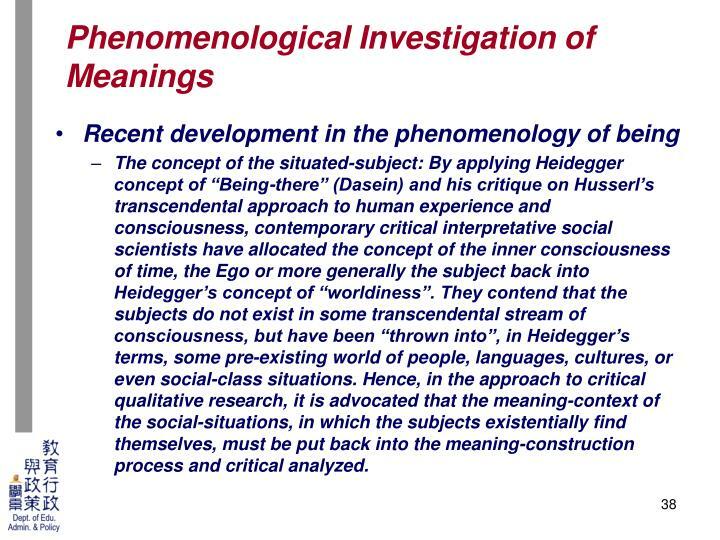 The concept of the situated-subject: By applying Heidegger concept of “Being-there” (Dasein) and his critique on Husserl’s transcendental approach to human experience and consciousness, contemporary critical interpretative social scientists have allocated the concept of the inner consciousness of time, the Ego or more generally the subject back into Heidegger’s concept of “worldiness”. 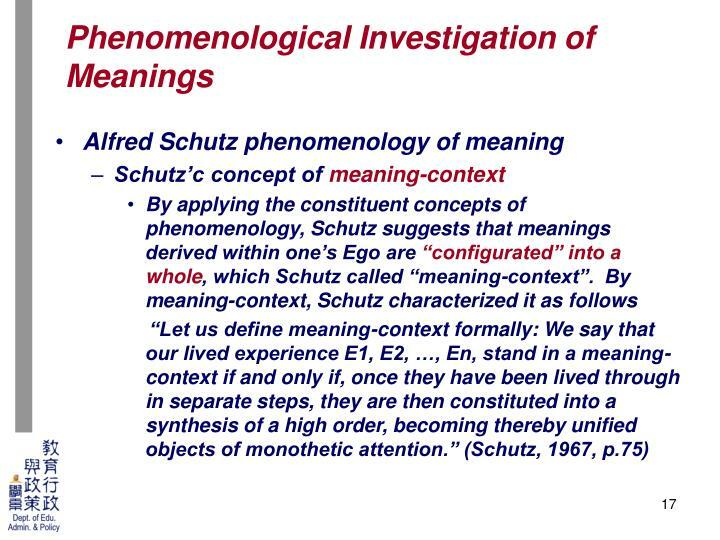 They contend that the subjects do not exist in some transcendental stream of consciousness, but have been “thrown into”, in Heidegger’s terms, some pre-existing world of people, languages, cultures, or even social-class situations. 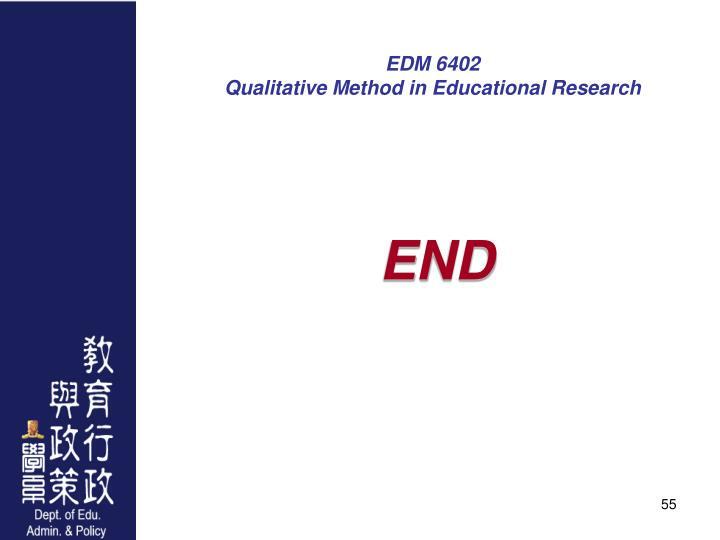 Hence, in the approach to critical qualitative research, it is advocated that the meaning-context of the social-situations, in which the subjects existentially find themselves, must be put back into the meaning-construction process and critical analyzed. 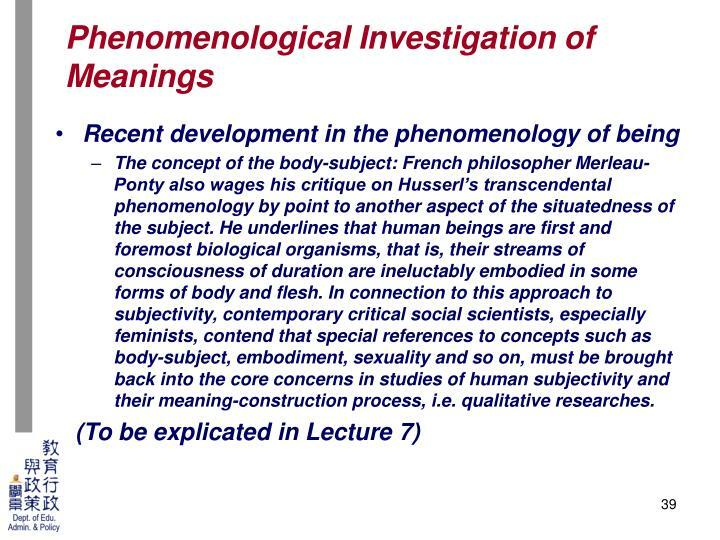 The concept of the body-subject: French philosopher Merleau-Ponty also wages his critique on Husserl’s transcendental phenomenology by point to another aspect of the situatedness of the subject. He underlines that human beings are first and foremost biological organisms, that is, their streams of consciousness of duration are ineluctably embodied in some forms of body and flesh. 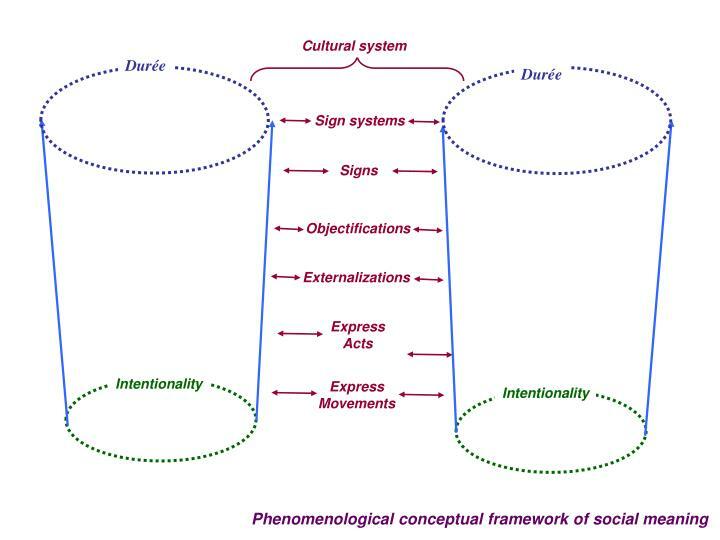 In connection to this approach to subjectivity, contemporary critical social scientists, especially feminists, contend that special references to concepts such as body-subject, embodiment, sexuality and so on, must be brought back into the core concerns in studies of human subjectivity and their meaning-construction process, i.e. 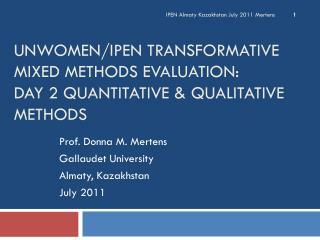 qualitative researches. 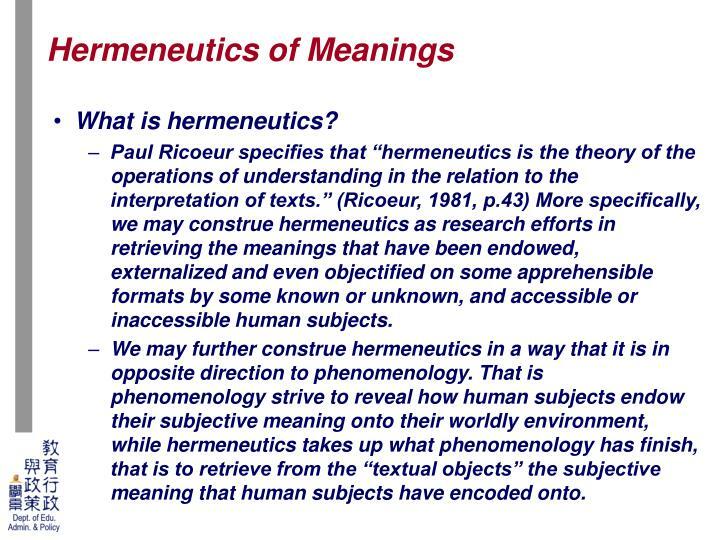 Paul Ricoeur specifies that “hermeneutics is the theory of the operations of understanding in the relation to the interpretation of texts.” (Ricoeur, 1981, p.43) More specifically, we may construe hermeneutics as research efforts in retrieving the meanings that have been endowed, externalized and even objectified on some apprehensible formats by some known or unknown, and accessible or inaccessible human subjects. 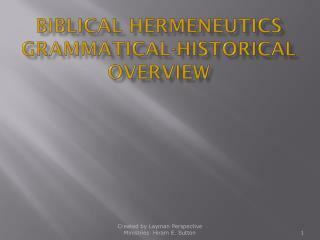 We may further construe hermeneutics in a way that it is in opposite direction to phenomenology. 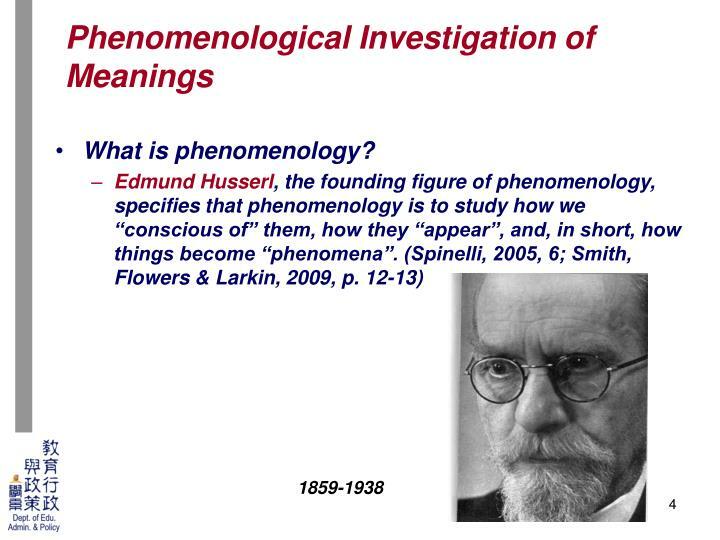 That is phenomenology strive to reveal how human subjects endow their subjective meaning onto their worldly environment, while hermeneutics takes up what phenomenology has finish, that is to retrieve from the “textual objects” the subjective meaning that human subjects have encoded onto. 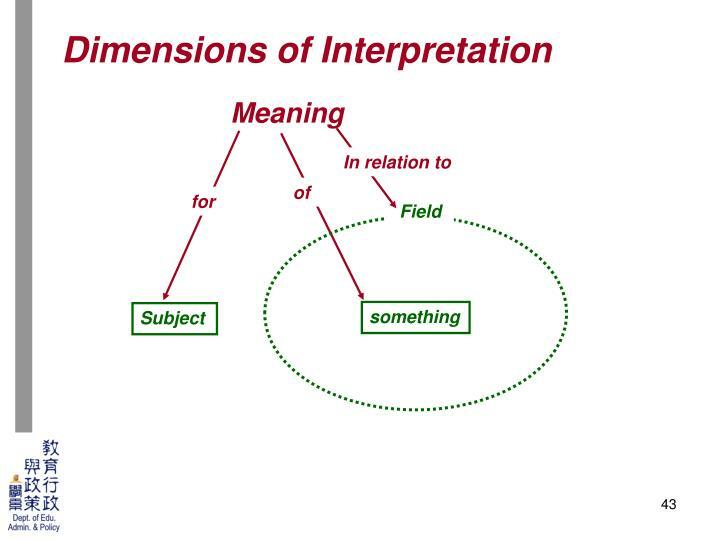 The perspective tenet: "The meaning of any fact, proposition, or encounter is relative to the perspective or frame of reference in terms of which it is construed." 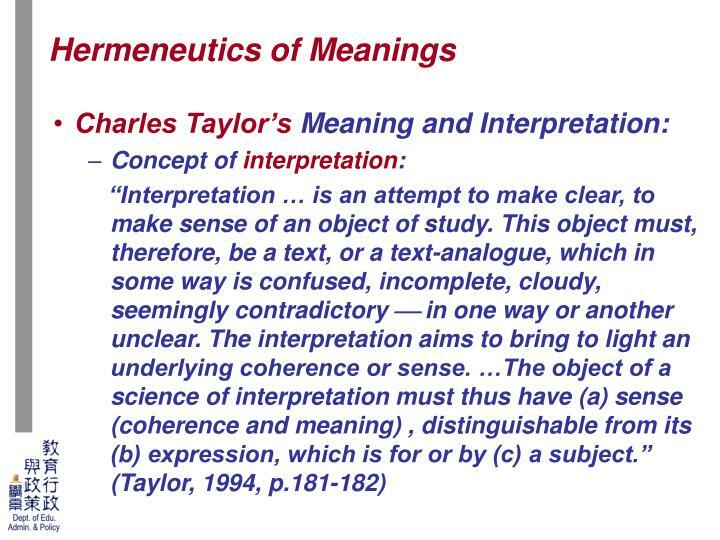 (Bruner, 1996, p. 13) This tenet basically resonates with Charles Taylor 's conception of meaning, which specifies that meanings are meaningful for someone, of something, and in a specific field and/or context, in short in perspective. 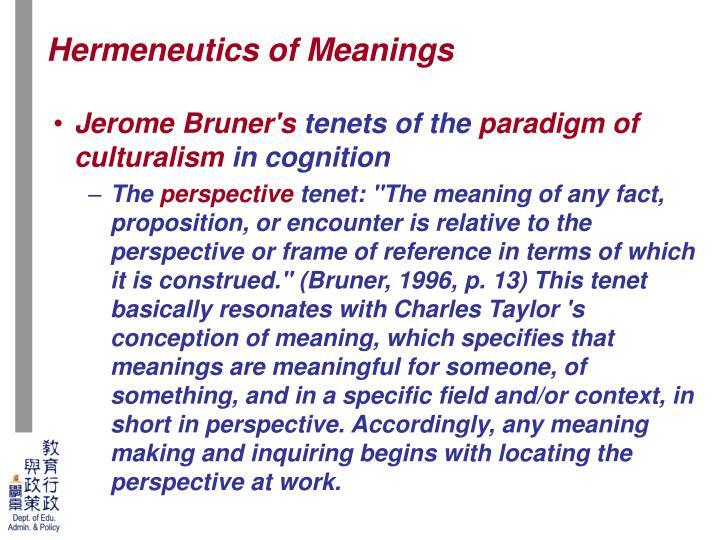 Accordingly, any meaning making and inquiring begins with locating the perspective at work. 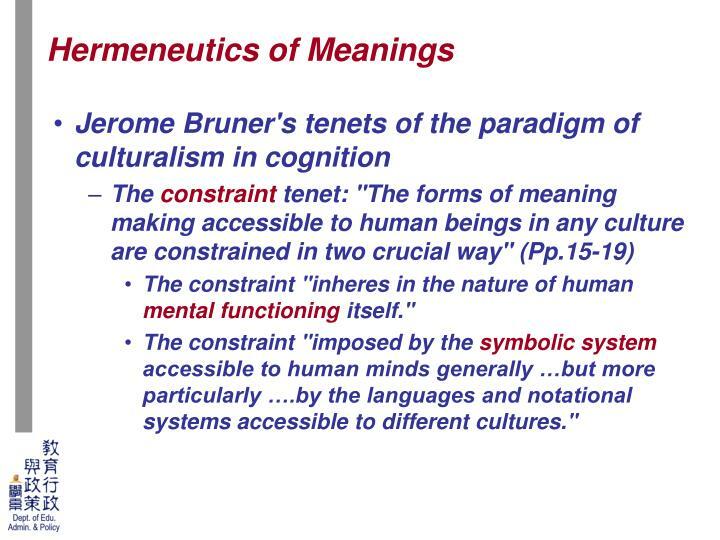 The constraint "inheres in the nature of human mental functioning itself." 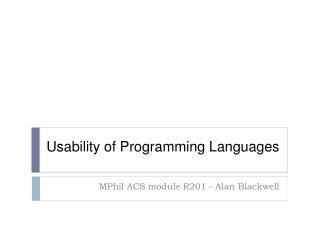 The constraint "imposed by the symbolic system accessible to human minds generally …but more particularly ….by the languages and notational systems accessible to different cultures." 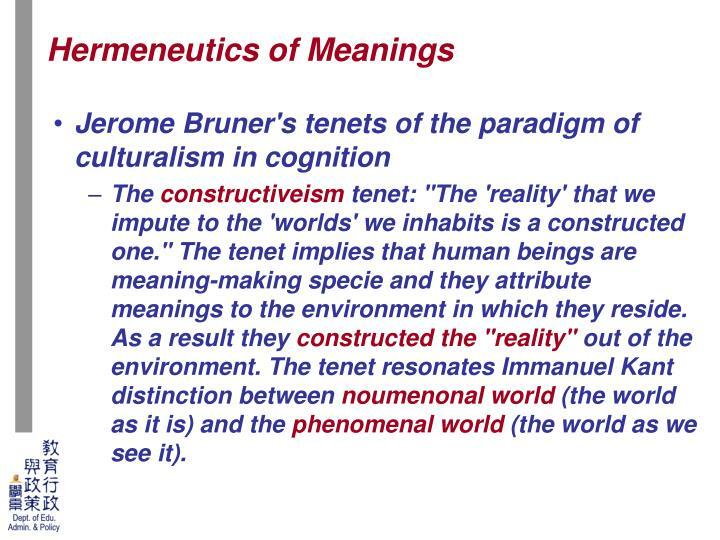 The constructiveism tenet: "The 'reality' that we impute to the 'worlds' we inhabits is a constructed one." 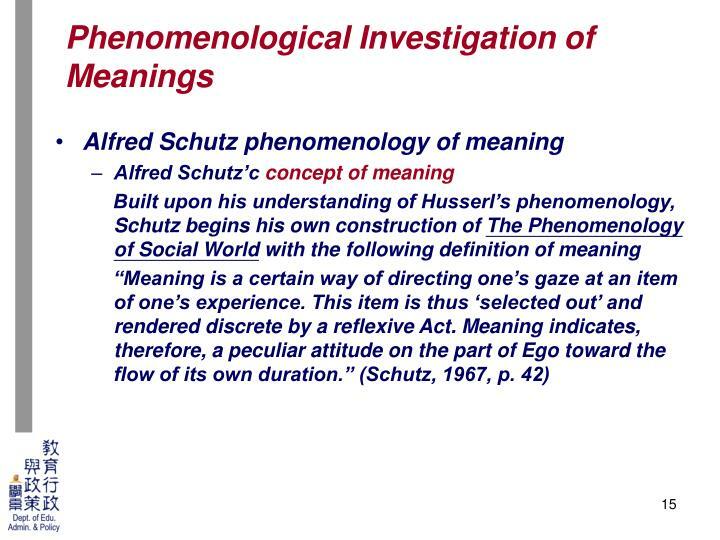 The tenet implies that human beings are meaning-making specie and they attribute meanings to the environment in which they reside. 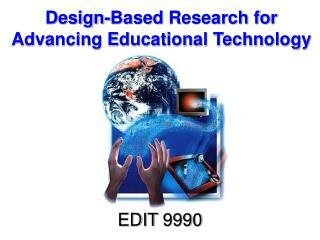 As a result they constructed the "reality" out of the environment. 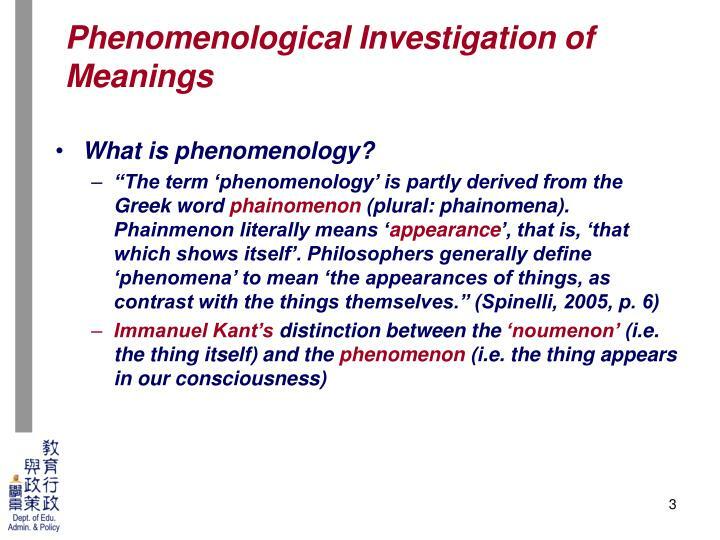 The tenet resonates Immanuel Kant distinction between noumenonal world (the world as it is) and the phenomenal world (the world as we see it). 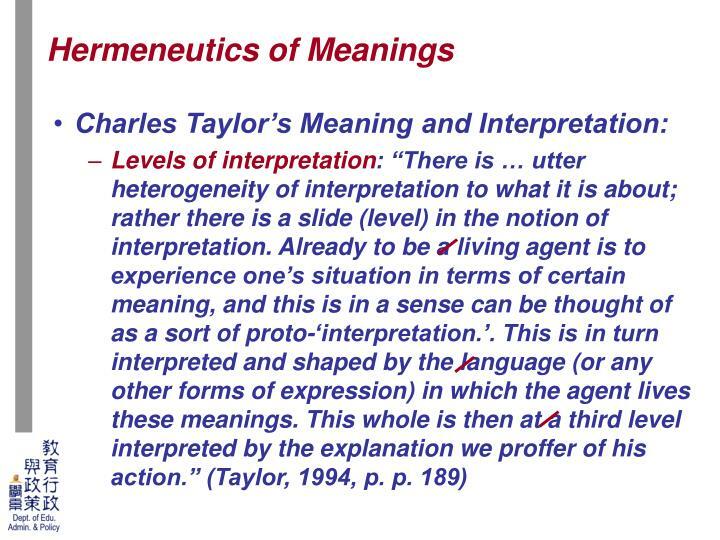 The externalization tenet: All meaning making are "work", i.e. 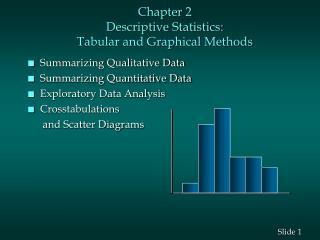 deliberate efforts of an individual or a group of individuals. 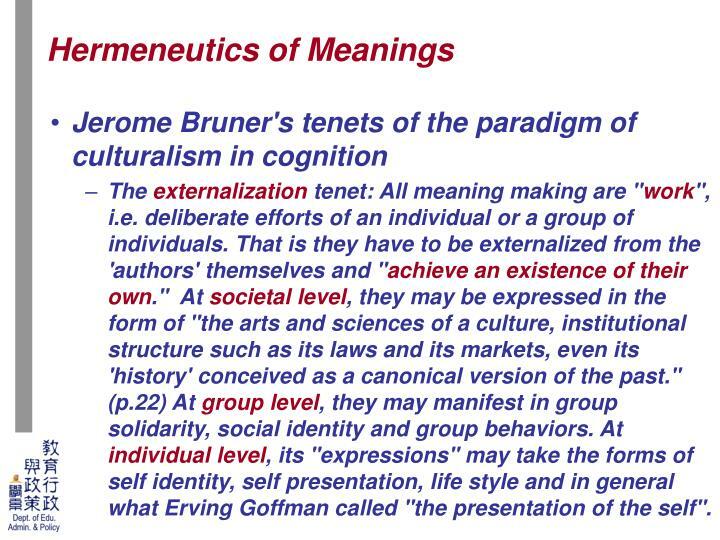 That is they have to be externalized from the 'authors' themselves and "achieve an existence of their own." 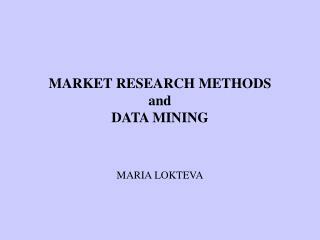 At societal level, they may be expressed in the form of "the arts and sciences of a culture, institutional structure such as its laws and its markets, even its 'history' conceived as a canonical version of the past." 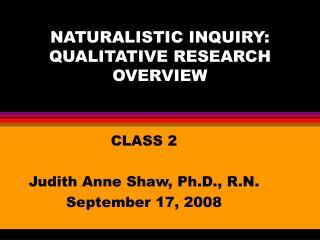 (p.22) At group level, they may manifest in group solidarity, social identity and group behaviors. 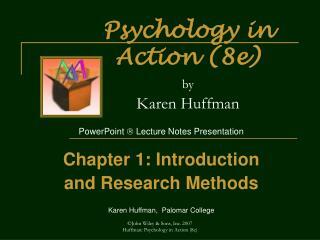 At individual level, its "expressions" may take the forms of self identity, self presentation, life style and in general what Erving Goffman called "the presentation of the self". 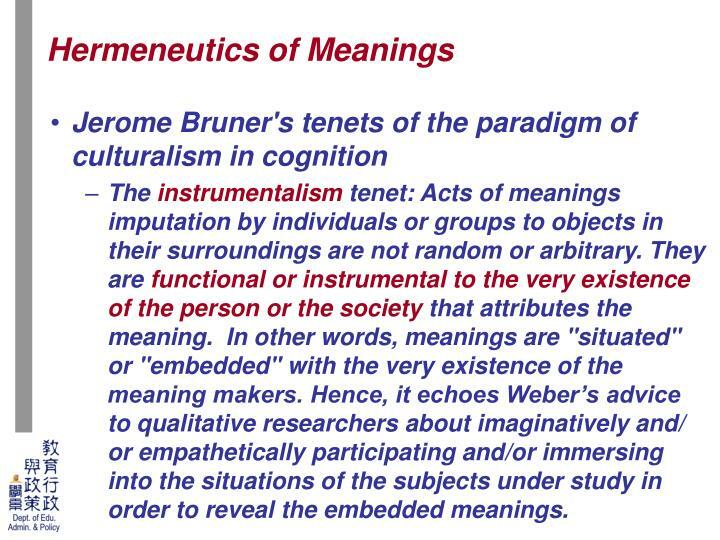 The instrumentalism tenet: Acts of meanings imputation by individuals or groups to objects in their surroundings are not random or arbitrary. 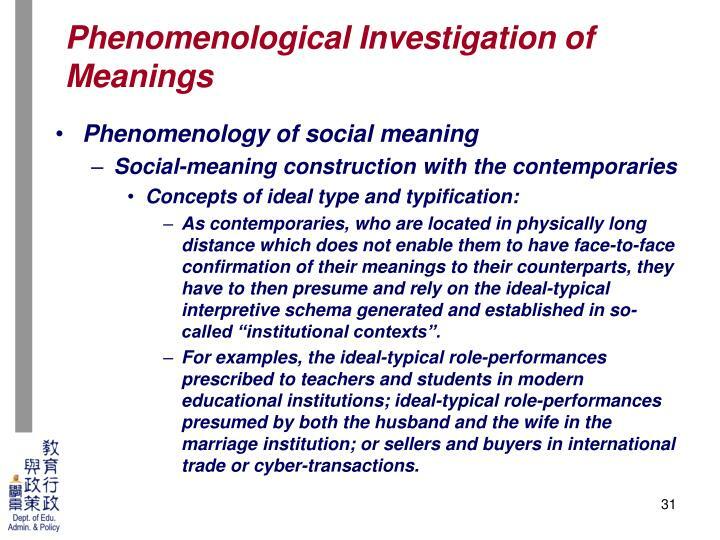 They are functional or instrumental to the very existence of the person or the society that attributes the meaning. 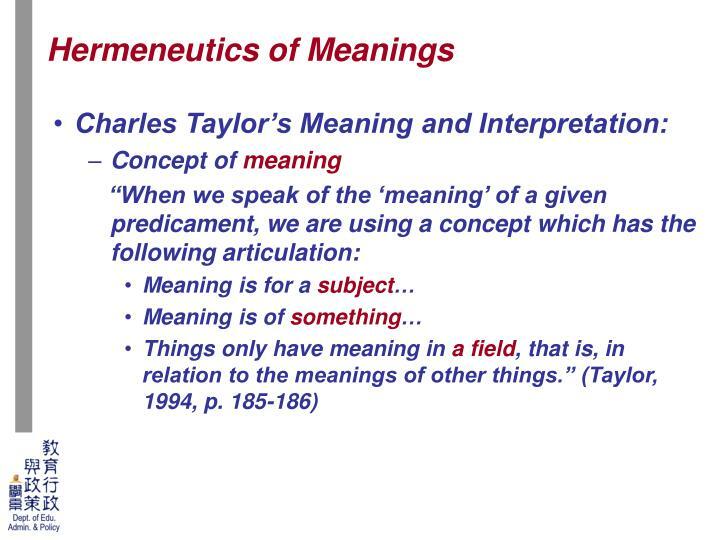 In other words, meanings are "situated" or "embedded" with the very existence of the meaning makers. 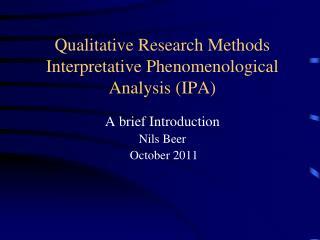 Hence, it echoes Weber’s advice to qualitative researchers about imaginatively and/ or empathetically participating and/or immersing into the situations of the subjects under study in order to reveal the embedded meanings. 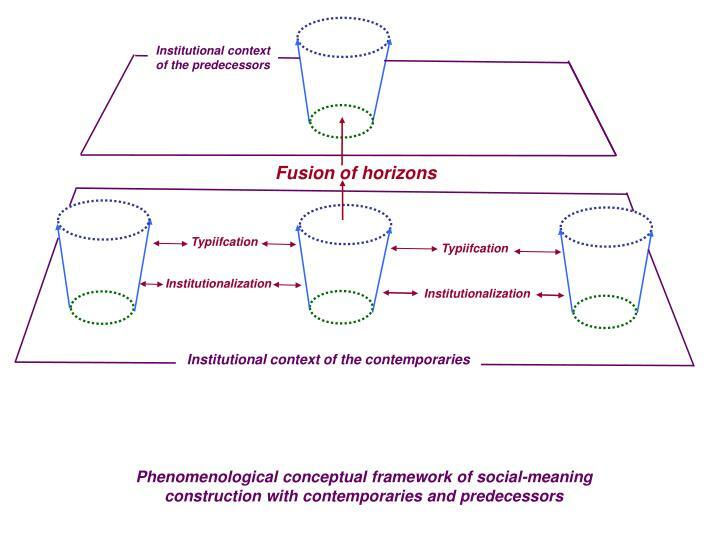 As systems of meanings of a society have been routinized into patterned and regular ways of doing things and ways of life, social institutions emerge. 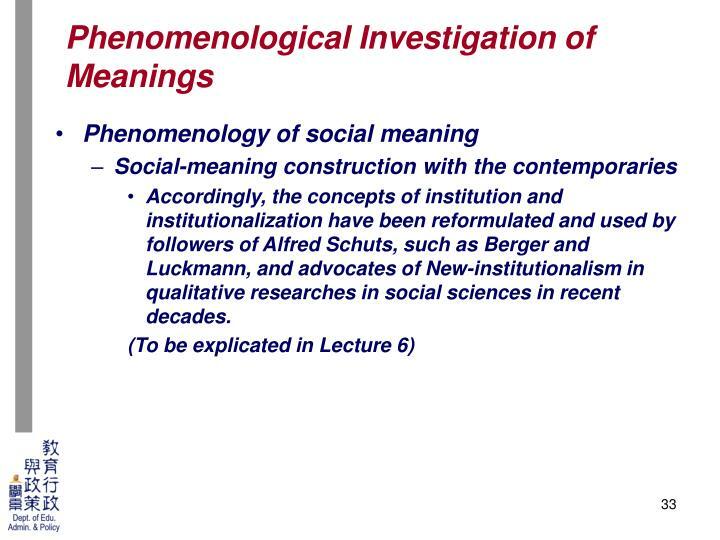 In other words, social institutions are one of the essential parts of the socially constructed reality of human kind. 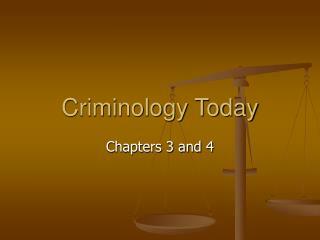 They are the embodiments and expressions of the fundamental meanings and values of a given society. 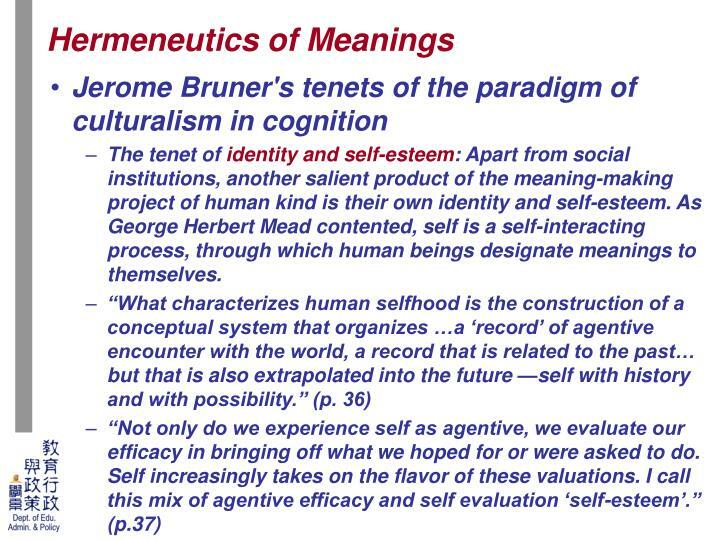 The tenet of identity and self-esteem: Apart from social institutions, another salient product of the meaning-making project of human kind is their own identity and self-esteem. As George Herbert Mead contented, self is a self-interacting process, through which human beings designate meanings to themselves.